The winners of the 2018 Tes FE Awards, held in association with Education Training Foundation were announced on Friday 23 February 2018 at the Grosvenor House Hotel, Park Lane, London. Through a combination of public and targeted provision, Lancashire Adult Learning provides learning opportunities for adults across the county. Its aim is to enable all adults in Lancashire, from all walks and stages of life, to learn something new and shape their own futures, and it offers an extensive range of subjects to learners, with over 2,000 courses delivered through more than 300 venues. Local community and strategic partnerships enable the provider to respond to a wide range of community needs and to develop an innovative, tailored and community-focused curriculum aligned to local, regional and national priorities. Working with strategic partners in the Department for Work and Pensions and Lancashire County Council has enabled Lancashire Adult Learning to deliver learning to 2,400 employability learners, and it has also supported learning sessions in over 50 libraries, assisting the government’s library ambitions strategy. Its provision has a 99.9 per cent retention rate, with 99.4 per cent of community learners achieving their end-of-course target. Of the parents attending family-learning courses, 96 per cent said that their children’s behaviour had improved, and 99 per cent of parents attending family English and maths classes said that they were able to play a greater part in their children’s education and attainment. Congratulations to Lancashire Adult Learning, the inaugural adult and community learning provider of the year. Busy Bees began to offer apprenticeships in 2003 to ensure a pipeline of high-quality staff for its 329 nurseries. A decade on, the programme’s success led to the creation of its sister company, Busy Bees Training Academy. In 2017, the training provider, based in Staffordshire, achieved an 89 per cent success rate for all apprenticeship programmes, compared with a UK average of 65 per cent. And it no longer simply focuses on meeting the staff needs of Busy Bees: it trains apprentices for more than 100 external organisations. In total, 3,765 learners have upskilled through the apprenticeship route, with 879 school leavers recruited on to an apprenticeship between 2012 and 2017. Busy Bees Training Academy currently chairs the early years trailblazer group, working with employers to develop apprenticeship standards from level 2 through to level 6 – a progression route that particularly impressed the judges. Partnering and holding events with organisations such as the Job Centre, the Prince’s Trust, Sport 4 Life and gypsy and traveller outreach services, Busy Bees Training Academy gives long-term unemployed young people a “clear and exciting career path in childcare”. Last year, every apprentice who completed their level 2 programme went on to become a nursery practitioner. City of Glasgow College was highly commended in this category. Now 67, Keith Haynes has worked in further education for over 43 years. The engineering work-based assessor continues to work part-time managing Bedford College Group’s engineering assessors’ team, overseeing its work with 100 apprentices and 70 employers. He has been instrumental in reigniting the Weetabix company apprenticeship programme. Having helped to design the maintenance engineering and manufacturing apprenticeship programmes, and helped to recruit and induct the apprentices, he ensured that the manufacturing apprentices achieved their level 2 apprenticeships and they are now progressing on to level 3. As a result of that success, Weetabix doubled its number of apprentices, with plans to further grow by similar numbers over the next few years. The company also awarded Haynes and the Tresham College apprenticeship team the “Winning With Weetabix” accolade. Haynes has pioneered the introduction of the level 4 higher apprenticeship in engineering for Tresham College. The scheme was found to not only meet the needs of local employers, but it also turned out to be cost effective. According to the judges, Barking and Dagenham College has “holistically and usefully” integrated Stem – science, technology, engineering and maths – across wider curriculum areas. This has facilitated a series of innovative projects across a range of subject areas and developed a creative and engaging way of teaching and learning. It has also enhanced partnerships among staff, overcoming workforce challenges. The East London college launched its Stem centre in 2013, and since then has developed a cross-college collaborative Team Teach initiative designed to create an innovative and enriching Stem learning experience for all students. The college’s commitment to Stem has meant that it has become a compulsory strand of curriculum planning, and is now integrated within other subjects. Assessment opportunities have also been transformed: students can use alternative methods to demonstrate their learning, away from the traditional written assignment and PowerPoint presentation methods. Approaches have included project-based learning, bringing to life the students’ learning experience, and developing essential skills required for employment: skills such as problem-solving, creativity and the use of technology. Students have also learned to work in a team, communicate, take risks and develop independently. The Stem team work closely with curriculum staff to develop bespoke practical activities and projects that fulfil the learner’s assessment criteria. The challenge is to shift the mindset of teachers away from tradition methods of delivery to ones that will engage and motivate 21st-century learners, and the college runs training sessions using hands-on practical activities. The Equal Voices project at this East London training provider supports new migrant and refugee women living in social isolation or economic deprivation to become community leaders. It was developed following a call from Citizens UK for more representation of people from migrant backgrounds in campaigning. The project involves a range of activities, from capability workshops celebrating women’s skills to community volunteering and wraparound English for speakers of other languages (Esol) training. It has led to the creation of a wide variety of events and activities that have had a transformative impact on the participants. In 2016-17, the 104 women who took part ran seven listening campaigns; 58 community conversation sessions with over 40 regular attendees; five national campaigns; five local campaigns; seven capability workshops; and three charity fundraisers. Through Equal Voices, 102 women (98 per cent) achieved qualifications at entry level 3, level 1 or level 2 in Esol or functional skills, while 13 per cent gained employment and 81 per cent moved on to further study. Perhaps more impressive, 24 of the women who took part in the programme became community guides themselves, and continue to engage other disempowered or isolated local people. A strong partnership with the Volvo Group has allowed Leicestershire’s Stephenson College to deliver unique apprenticeship programmes that make a significant measurable contribution to the employer. Through this scheme the college has attracted attention from elsewhere in the industry, leading to another mutually beneficial relationship with Renault. In a bid to better meet its business needs, Volvo Trucks made radical changes to its apprenticeship programme during 2013-2016. The focus was on aligning standards with business requirements, training on the latest technology and changing the teaching model. Volvo employees also became college employees, as lecturers, while still spending a number of weeks each year in the industry to keep their knowledge up-to-date. Industry-standard training is further enabled by the facilities and resources both parties have invested in. These include state-of-the-art HGV training workshops that mirror the workplace environment. The bespoke nature of the programme, embedding Volvo technical training into the apprenticeship, is a strength of this offer. In 2016, Renault followed suit: it moved learners to the college, brought in new trainers from the Renault network and realigned the programme to its Renault Trucks business. The benefit to Renault was quickly evident: year one apprentices demonstrated competence 75 per cent faster than when under the previous scheme. The judges said Stephenson College’s work “provides a benchmark for FE and industry collaboration in the development of apprenticeship programmes, which demonstrates the responsiveness of FE in support of the skills and talent acquisition needs of a key sector of the UK economy”. Across its three campuses in Hampshire, Fareham College supported 98 per cent of its students into employment, higher education or work-related learning in 2015-16. This success was down to a series of teaching, learning and assessment measures. The strategy included a commitment to spend 1 per cent of turnover on staff development, and the holding of an annual “star awards” event to celebrate staff achievement. Recent teacher-led initiatives have seen the development of innovative projects such as www.teacherstakeaway.co.uk, a website designed to increase the amount of outstanding teaching, learning and assessment. The college’s dedication to staff wellbeing led to its being highly commended in the “most improved” category in the Britain’s Healthiest Workplace 2017 competition. The college prides itself on its support for careers education, and 75 per cent of students undertook meaningful, curriculum-relevant work placements during 2016-17. Its military mentor programme gives young people at risk of becoming Neet (not in education, employment or training) the essential skills for military and uniformed careers, while its civil-engineering training centre connects up to 140 apprentices with dozens of local businesses. The www.fareham.social app is designed to encourage communication among students. It was in 2007, shortly after Dudley College of Technology had been rated “inadequate” by Ofsted, that Lowell Williams was appointed principal. He put in place a range of remedial actions, communicated a clear vision to staff and governors, and laid out a detailed annual plan. He then worked tirelessly to achieve it. The entry for this award evidences how Williams’ relentless pursuit of excellence has raised the expectations and aspirations of staff, students and stakeholders. Following another inspection by Ofsted last year, Dudley was rated “outstanding”, with the report acknowledging high levels of student engagement, satisfaction and achievement, and greatly increased student recruitment. The £60 million development of the Dudley Learning Quarter, led by the college, has helped to rejuvenate the town centre economically and revitalise the skills base of the local West Midlands area. Williams’ performance-management approach has helped to foster a culture of continuous improvement and, according to the college’s submission, he stretches those around him to reach their full potential with a combination of challenge and support. He has raised the profile of the college locally, regionally, nationally and internationally. The college’s overseas work has bolstered the UK’s reputation and brought in resources for use locally. It is more than 40 years since Jill Westerman began her career in education. Before going to university, she found herself working at the West Midlands Travellers’ School. Then, following stints teaching English in Spain and working in adult education in London and Rotherham, in 1993 she joined the institution with which her name has become synonymous: Northern College, the residential college for adult and community education in Barnsley. Westerman initially taught literacy, English and community programmes, and managed the skills for life and access to HE programmes, before joining the senior management team in 2002. Five years later, she became principal. This career move came at a time when funding for adult learning was undergoing a significant contraction, but Westerman’s ability to inspire trust and confidence allowed her to lead the college successfully through a period of severe financial uncertainty, moving it from a serious financial deficit to grade 1 financial health. It was rated “outstanding” in three consecutive Ofsted inspections. Beyond her work at the college, Westerman has taken every opportunity to raise the profile of adult education. She has been pivotal in the work of the Institutes for Adult Learning group, which she helped to set up and now chairs. She has also been heavily involved with the All-Party Parliamentary Group for Adult Education, and has commissioned and conducted research on adult learning and leadership. In 2015, when the use of technology in many colleges was sporadic, and many staff lacked confidence in using it, a strategic decision was taken at Basingstoke College of Technology. The college would, its leaders decided, start to move towards a curriculum model that firmly embedded blended learning and the use of digital technologies into the daily lives of its teaching staff. At the heart of this was an investment in resources and infrastructure, alongside a college vision of what was to be achieved. And while blended learning was introduced to provide all full-time level 2, level 3 and access learners with one hour of independent timetabled study each week, the college says the biggest journey has been made by its own staff. With the right support and training now in place, they have been able to learn, to develop and to explore how they use information and learning technology for the benefit of the students. The creation of a team of student digital leaders has been particularly empowering, while the development of the college website has provided a focal point for training and resources. In its submission, the college stated that staff who previously had little knowledge about the use of technologies were now training other staff and showcasing how they had used these technologies to enhance their own teaching and learning. The judges were impressed with the college’s “strategic approach to the use of technology across the curriculum”.  This was the first time that the winners of the five institutional categories – FE college, training provider, sixth-form college, as well as the inaugural specialist provider and adult and community learning provider awards – have gone head-to-head for the right to be named overall provider of the year. And the judging panel was unanimous in its decision that it was Foxes Academy – the first specialist provider of the year – which should also claim the flagship title. Foxes Academy, based in Somerset, is an independent specialist college and training hotel for young adults with learning disabilities. Helping these learners into sustained employment is a difficult job: according to the British Association for Supported Employment, the proportion of people in England who have learning disabilities and are in paid employment fell from 7.1 per cent in 2012 to just 6 per cent in 2015. For the learners at Foxes, the employment rate has consistently been over 85 per cent, year after year, with a sustained employment rate of 77 per cent since 2015 – figures that many general FE colleges, let alone specialist providers, would be envious of. Foxes Academy aims to equip learners with the skills, knowledge and confidence to successfully shape their own futures. The judges said that the provider’s engagement with local employers was exceptional, offering real pathways for their learners, as were its 100 per cent pass rates in all formal examinations and assessments in 2016-17. This will be awarded to the provider that has demonstrated exceptional performance in the past academic year. It covers the year 2017-18 and will be chosen from the winners of the Training Provider of the Year and College of the Year categories. Despite a large proportion of the college’s students coming from areas of deprivation, the wraparound services of the team have helped to deliver an improvement in student performance – with 96 per cent of graduating students progressing to higher education, apprenticeships and employment. A collaborative approach between the student services, curriculum and senior management teams has resulted in a culture where 94 per cent of students reported feeling safe at college. There has also been a 3 per cent drop in reported cases of bullying since last year. The student services team has tackled some difficult topics by providing a forum for debate, contributing to a culture of understanding and tolerance. The judges were captivated by Birkenhead Sixth Form College’s journey of transformation. In 2009, it was rated grade 3 by Ofsted. The college also had fewer than 20 per cent of students obtaining high grades, and, according to its awards submission, was “well into the bottom quartile on all value-added systems and had a mediocre progression profile”. Fast-forward to January 2017, and the college on the Wirral was rated “outstanding” by the inspectorate. Now 45 per cent of A-level candidates are obtaining high grades, and it sends nearly a quarter of its students to Russell Group universities. This improvement has not been down to a change in the college’s intake. The improvements have been the result of fundamental changes to every aspect of how the college works, realised through hard work and a common commitment to the values of positivity, ambition, resilience and thoughtfulness. Birkenhead has also put a strong focus on innovation, with examples including: the student mentoring scheme, endorsed by the University of Liverpool and now an accredited module; the BePART programme, proven by independent research to help those students who are struggling to improve their positivity and resilience; and an academic writing programme. While on its improvement journey, the college has also set up its own multi-academy trust (MAT), and now sponsors a local school. After visiting Foxes Academy in Somerset last year, Penny Mordaunt, the minister for disabled people at the time, praised it for “showing employers across the country how they can make the most of the huge pool of untapped talent that disabled people offer”. The academy is a specialist provider and training hotel that aims to give young adults with learning disabilities the skills, knowledge and confidence to shape their own futures. Its mission is to change the way society perceives people with learning disabilities. Striving for excellence, staff at the academy continually reflect, review and make changes to meet a variety of needs – a process that starts with the learner in regular one-to-one tutorials. All learners achieve nationally recognised qualifications in hospitality and catering, and develop their English, maths and ICT skills in functional skills courses leading to a range of English Speaking Board and City and Guilds qualifications. Independent living skills, including home economics, are taught in structured sessions as well as being embedded throughout the learners’ personal development, health and welfare time. Foxes Academy achieved 100 per cent pass rates in all formal examinations and assessments in 2016-17, with its 73 learners achieving 247 qualifications. Working with over 50 regional employers, it also sources and develops work-experience placements for its learners so they can transfer their learned skills successfully into the workplace. As a result, 77 per cent of its 2015 leavers have been employed since graduating. The judges paid tribute to the provider’s “tremendous employment outcomes and employer engagement”. The area of West Yorkshire served by Kirklees College suffers from significant deprivation. To better support those learners at risk of underachieving, the college gathers data to identify potential problems and take targeted action. This has included focusing staff development on key areas, not least supporting mental health issues. Over the past three years, the college has also introduced long-term transition support programmes, peer support, one-to-one regular interventions for mental health support, close monitoring and tracking of activity, and regular strategy meetings to plan next steps and identify barriers to learning. The impact, particularly on those students most at risk of missing out on opportunities, has been marked. Despite a significant upward trend in referrals for safeguarded students, there has been an over 12 per cent increase in achievement and pass rates. For those leaving care, achievement and pass rates increased by over 16 per cent. Among one extremely high-risk cohort with complex backgrounds and multi-agency support, retention is now on a par with the whole college – and there has been a 22.8 per cent increase in achievement from 2015-16. Overall attendance in 2016-17 was 86 per cent – with the biggest increase recorded among young parents and young carers. Alison Scattergood, who teaches barbering and hairdressing skills at East Durham College, serves as a great example of the genuinely exceptional quality that exists in the further education sector. As a result of Scattergood taking the lead for barbering provision at the college, student numbers have doubled over the past five years, and pass rates stand at 100 per cent for both level 2 and level 3. Progression into employment or the next level of study is 94 per cent, according to the college, and many students have gone on to compete successfully in regional and national competitions. Scattergood, who is hereself a renowned competitor at national level, motivates her students and encourages them to take part in industry-recognised contests. And her own skills are impressive: in 2014, she became the first woman to be named a British Master Barber. Last year, she was accepted as a member of the Fellowship of British Hairdressers, the biggest organisation supporting the sector. Scattergood also sits on the City and Guilds national barbering qualification advisory panel. Because of her reach into industry, students at East Durham benefit from engagement with a large range of employers, and are exposed to the very best practice in a vibrant industry. HIT Training has taken the lead on the apprenticeship agenda. It was the first hospitality training provider to offer the new apprenticeship standards, 16 months ahead of the deadline, and has worked closely with employers to help them to understand the best way to maximise their apprenticeship programmes. It also launched a sector-wide campaign to help to educate businesses on what the new apprenticeship levy, introduced last spring, means for them. Its levy handbook, designed to help businesses of all sizes understand the new funding system, was central to this campaign. Since April, HIT has launched four new apprenticeship standards: hospitality supervisor, team leader, chef de partie and customer service practitioner, and a further eight standards are to be launched soon. The Chef Academy now has 16 centres across the country, designed to help employers attract and retain chefs and to assist in plugging the national skills shortage. HIT also advises on the apprenticeship trailblazer group, and regularly provides panel speakers at national and local events, helping the sector to identify best practice and understand how to make the most of its investment in training. HIT’s internal observation team continually monitors staff and gives feedback on how to improve. Quality assurers provide regular support remotely and face-to-face. As a result, both learner satisfaction and employer satisfaction are high – at 94 per cent and 93 per cent, respectively.